I am happy to share with you the quilts I gifted to family at Christmas. 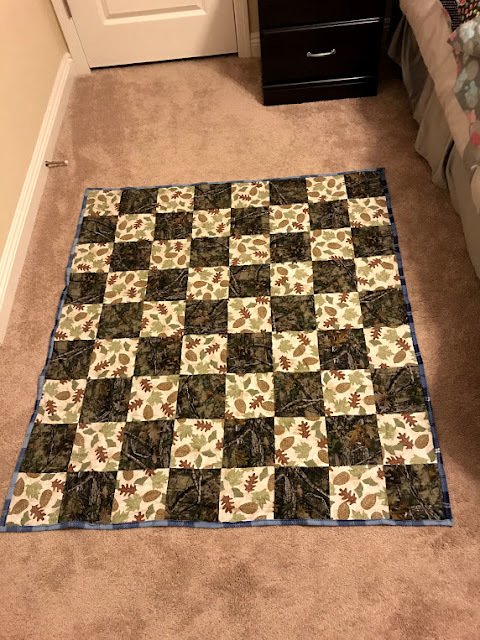 It was really hard not to share photos as I sewed away and completed them. We had a lot of family visit at Christmas and really enjoyed seeing everyone. I think everyone loved the little tv blanket quilts I made them. 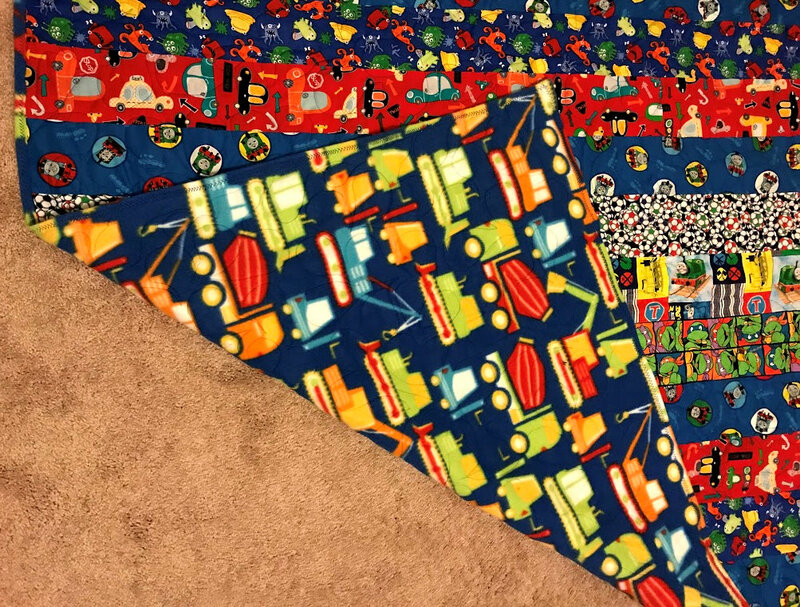 They are all a throw sized quilt with a fleece back and no batting. 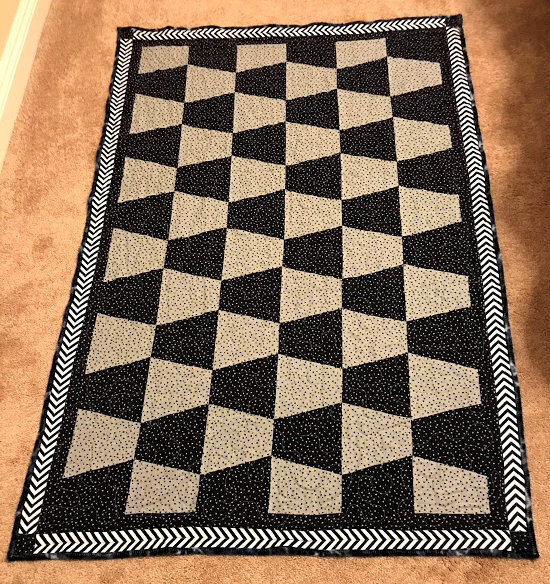 Light weight but warm enough to cover up while watching tv in the evening. 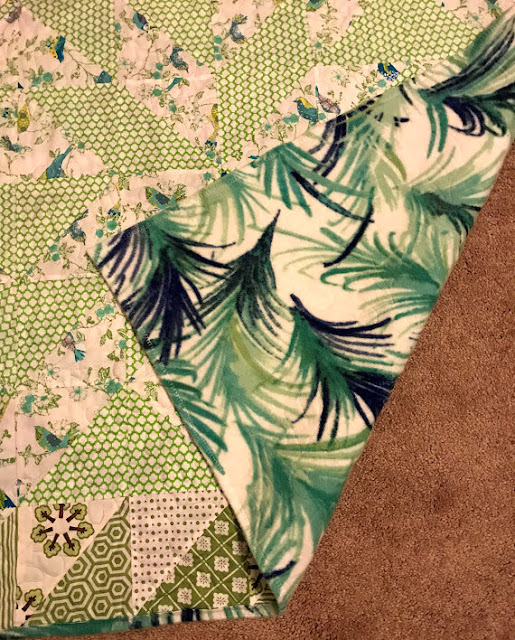 The tops were made from fabric I have collected (with the exception of one quilt top) and I used my Accuquilt to cut the pieces. I only used 3 dies between all 10 quilts and cutting went really fast using the dies. 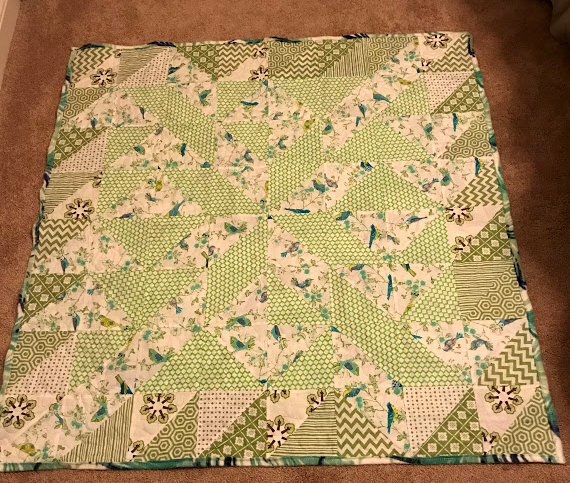 I didn't follow any pattern except for figuring out the layout on the pinwheel in the center of the green quilt. 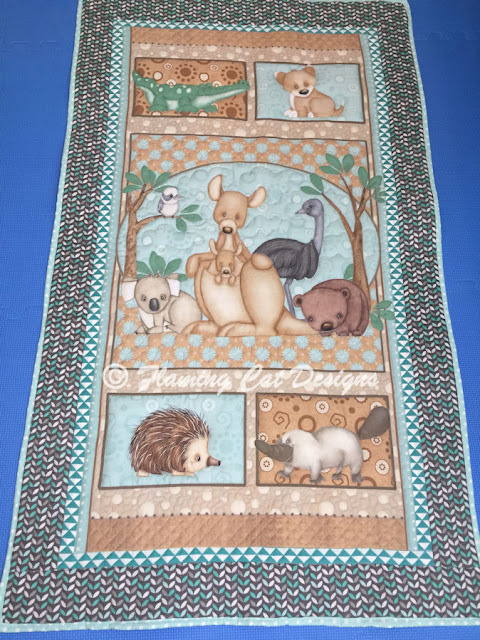 For the backing I decided to buy fleece and I caught a great sale of 50% off which really made me happy. 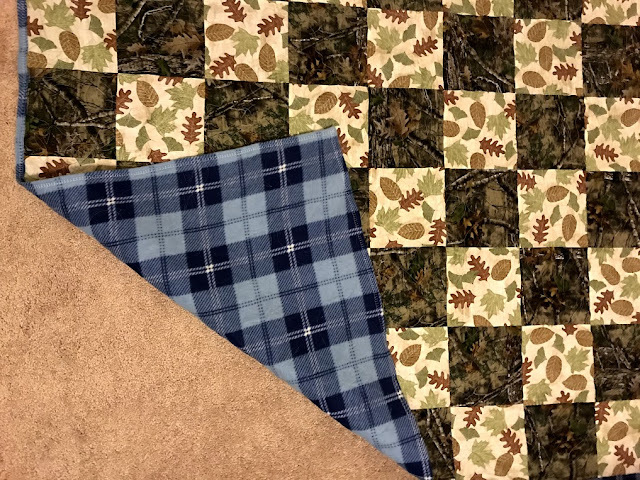 I decided to self bind the quilts with the fleece backing. 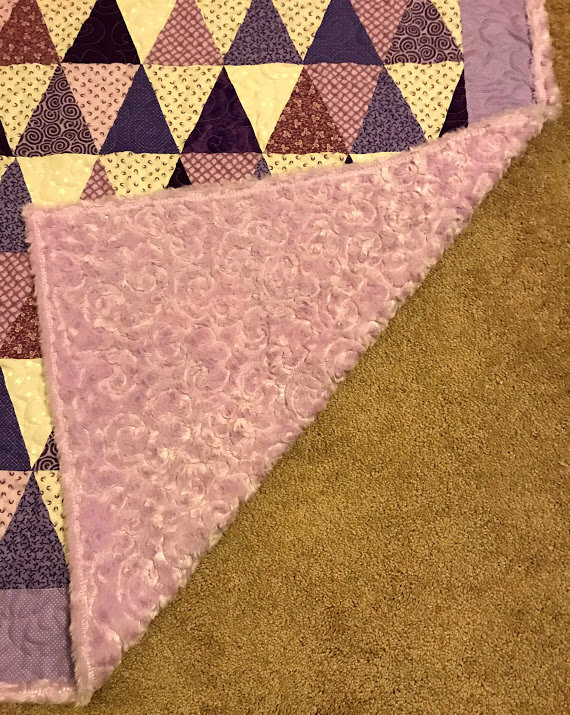 I love how the fleece backing frames the quilt with this self binding technique. Fleece does a lot of fuzz buildup in the bobbin area both during quilting and binding, so I did a lot of cleaning. The fabric is busy so most of the quilting stitches blends in on them quite a bit. 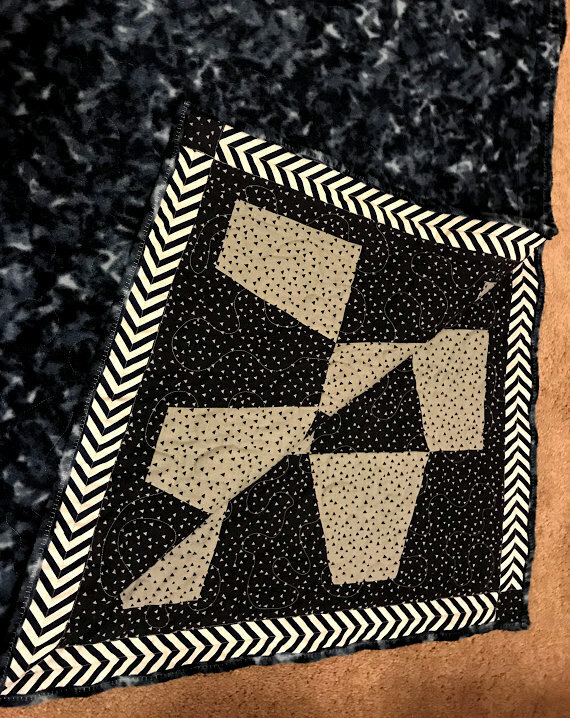 I did a couple of pantographs quilts, but most of them were just free motion meander on my Handi Quilter Avante. 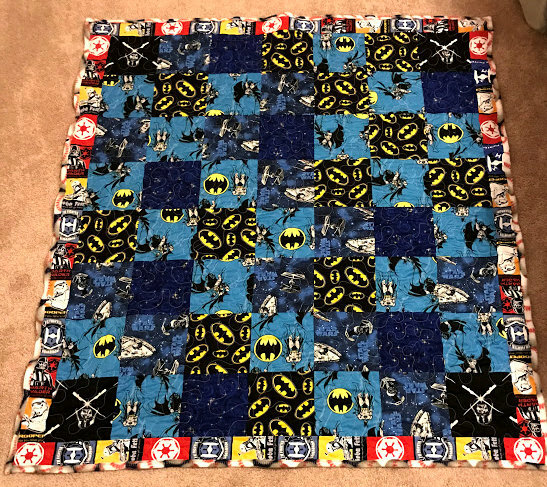 I used Omni thread on the top and bottom line in the bobbin. There are lots of photos in this post, and I hope you take a look at them all. I tried to match the fabrics for the person receiving them and to me that is part of the fun. 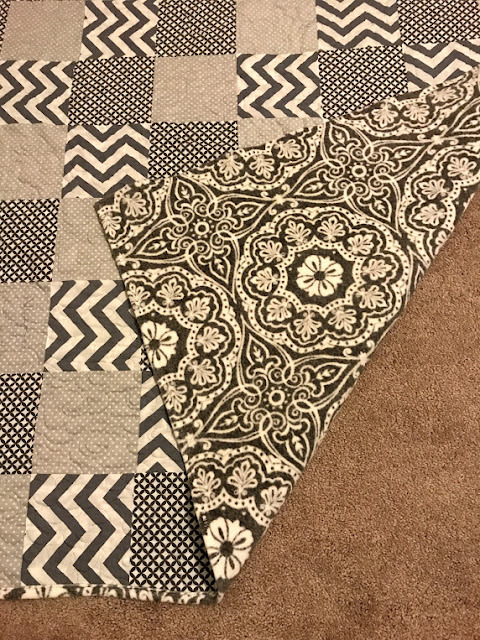 I love the process of planning and creating the quilt top and see it come to life. You will see I love color and printed patterns. 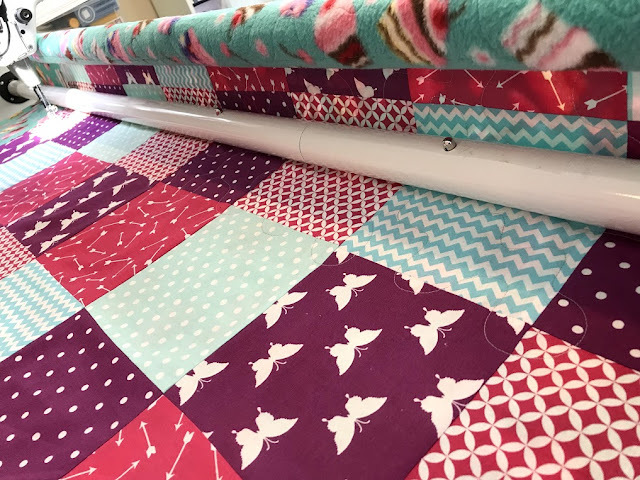 This bright quilt comes to life on the longarm. 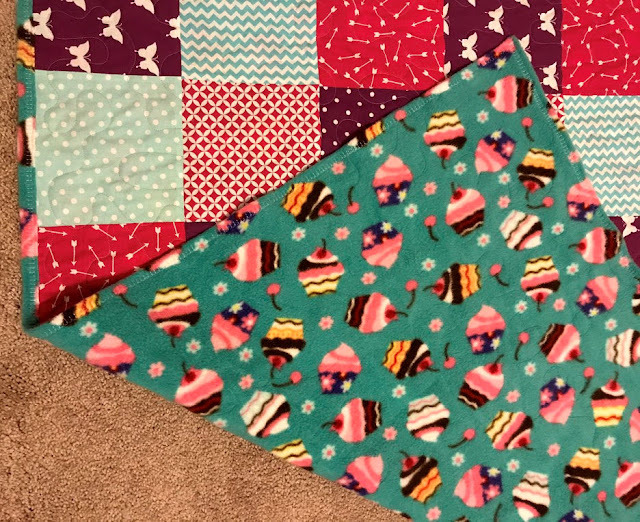 This fleece backing with cupcakes was perfect for the quilt. 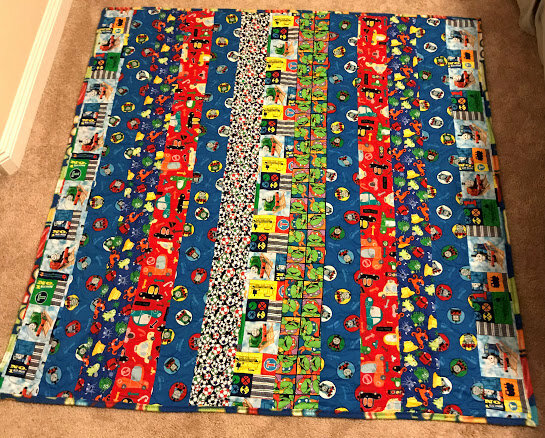 I love the construction truck fleece I found for this quilt. 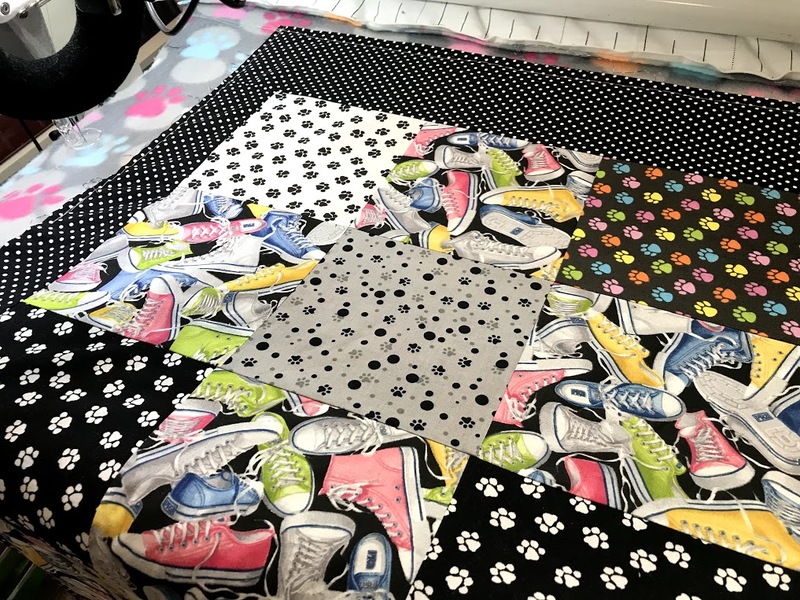 A quilt for a dog lover and tennis shoes for walking the dogs. I love how this quilt looks completed, so bright and yet dark at the same time. 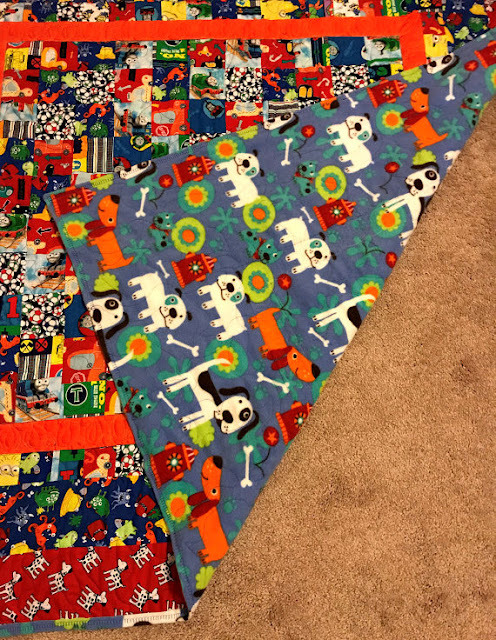 This fleece matches the front perfectly and looks great bound around the edges. Modern and a bit of an eye chart, but I think it works. The fleece is modern and thick and all the gray tones of this quilt work great together. I could have gone with a green or tan fleece but blue fits the outdoor theme of sky and water. 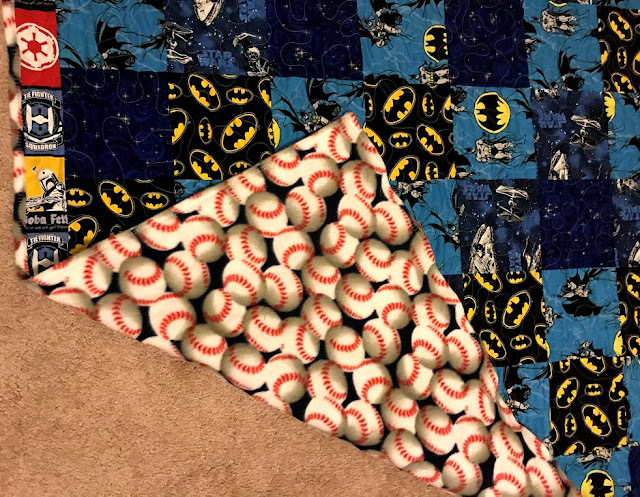 A boy quilt with baseballs, Starwars and Batman. Perfect for this boy quilt, baseballs on fleece. Quilt corner folded back to show the printed front and blue mottled fleece back. 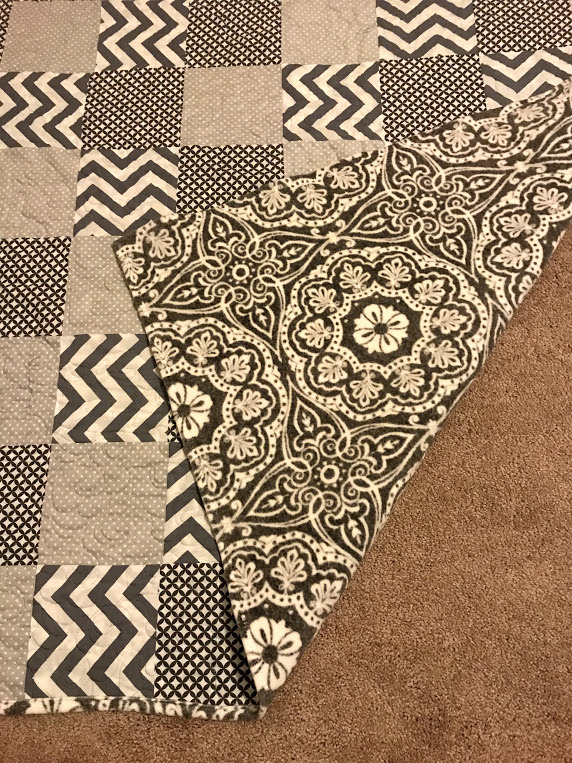 I cut some chevron print fabric in strips to make this arrow border that goes around the quilt. 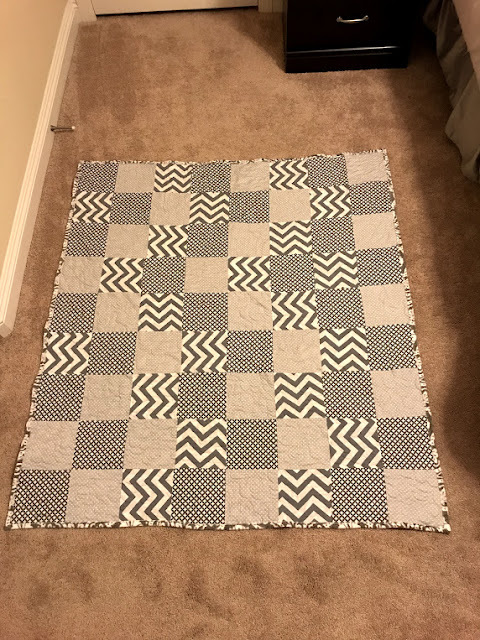 this feel modern and different than any other tumbler quilt I have made. 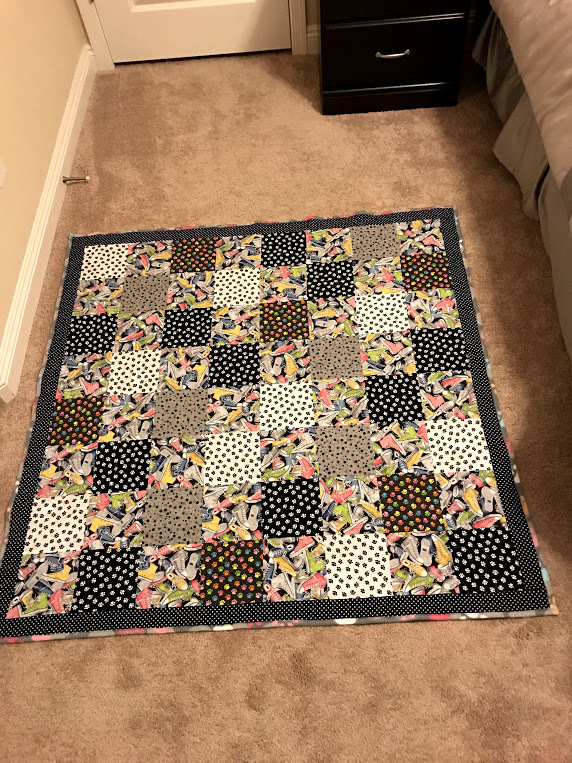 Such a fun quilt to make with all the bright pieces. 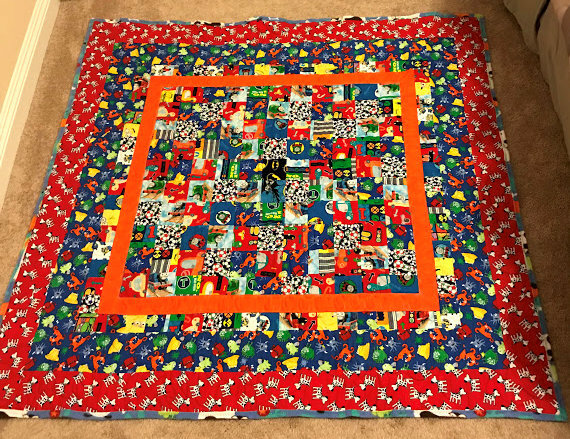 The bright orange inner border breaks up the zillion little print pieces. Cute dog fleece print goes great with the top. 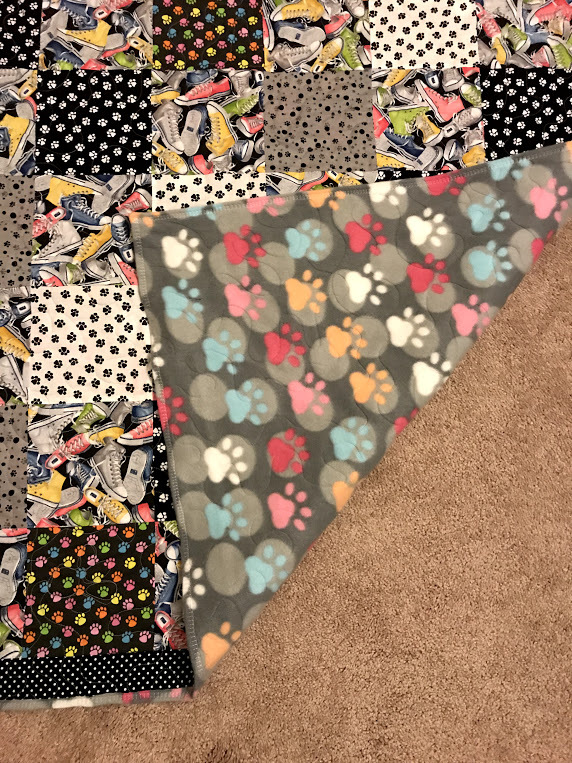 Fun faux fur minky fabric made this the softest quilt of the bunch. 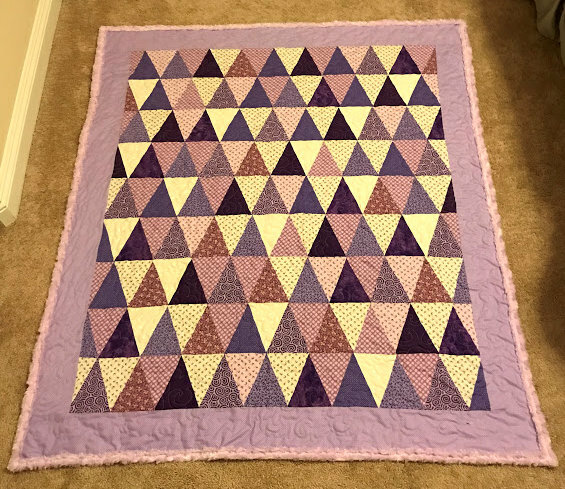 I love purple and lavender. The pinwheel in the center doesn't show up as well in the photo as in person. 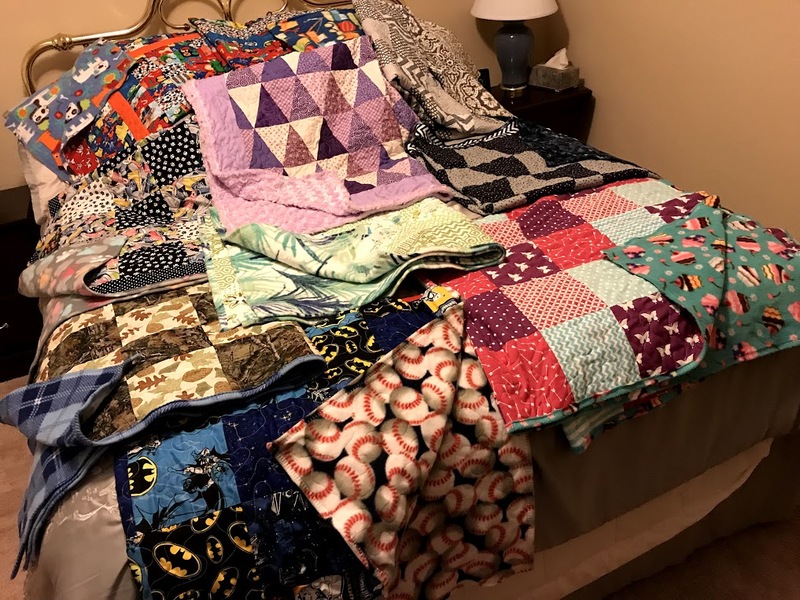 A fun pile of the completed quilts. 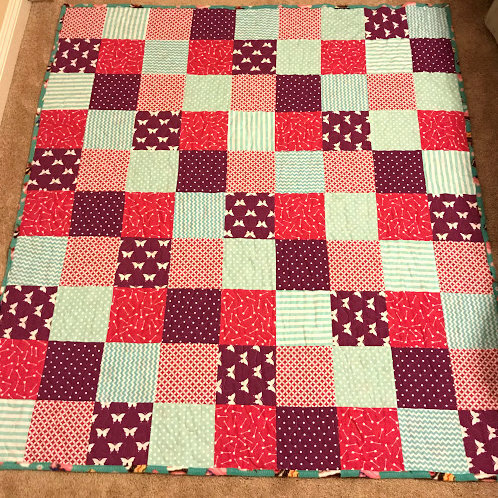 I hope you enjoyed looking at my quilts, I really enjoyed making them.